Laptop with all 2.5 Inches/ 9.5mm Thick Hard Disk Drive with SATA interface. · 9.5mm SATA to SATA HDD hard disk drive caddy adapter. · This 2nd Hard Disk Drive Adapter that gives you maximum storage. · Plug and Play, support hot swapping. 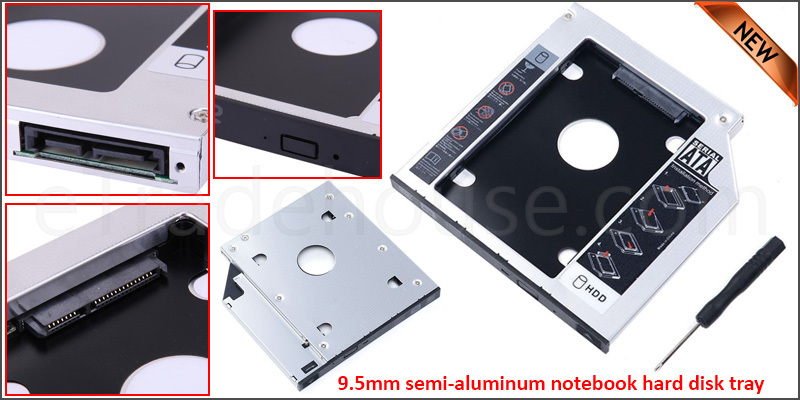 · Accepts 2.5 inch / 9.5mm (thickness) SATA HDD Hard Drive. · SATA interface. Fast and easy connection. · No cables / PSU / software driver needed. 1. Unpack the hard drive, Lift the hard drive caddy retaining latch, The Screws to the hard drive. 2. Insert the hard drive into the hard drive caddy. 3. Slide the hard drive into the connector until it locks into place. 4. Lower the hard drive cd caddy retaining latch until it snaps closed.